When the Oriana sailed from Southampton on Thursday she sailed with a full passenger list on a world cruise that is leaving well away from the usual first week of January. Meanwhile, the Queen Mary 2 is having a good season on the Atlantic, while Norwegian Sun next week offers a bargain crossing from Dover to Port Canaveral while other ships continue their seasonal liner voyages elsewhere. In Alaska, a new company, InnerSea Discoveries, shows signs of taking up where Cruise West left off and a portrait of a queen was unveiled last week in London. When the Oriana sailed from Southampton last week she did so with 1,710 passengers, of whom one-third will do the full 84-day world cruise and half of the remaining number will be doing a long cruise between the UK and Australia. The balance will be joining the ship for short sectors of two or three weeks as she works her way around the world. As she left Southampton, Carol Marlow, P&O Cruises managing director noted that "a world cruise is the ultimate extended holiday experience and we are seeing increased demand for the full trip not only from regular cruisers but also from first timers looking for a different, once in a lifetime experience. Our passenger research has shown that the grown up gap year is becoming increasingly popular... Oriana's autumn departure has been a popular choice, arriving home in time for Christmas." Her route will take her by way of Madeira to St Lucia, Margarita and Curaçao in the Caribbean, through the Panama Canal to Acapulco and San Francisco and then across the Pacific via Honolulu and Apia to Auckland, Wellington, Sydney and Brisbane and then via Whitsunday Island to Manila, Hong Kong, Phu My, Bangkok, Ko Samui and Singapore before returning via Port Kelang, Mumbai and Sharm el Sheik, through the Suez Canal to Port Said and calling at Piraeus and Lisbon on her way back to Southampton by Christmas. 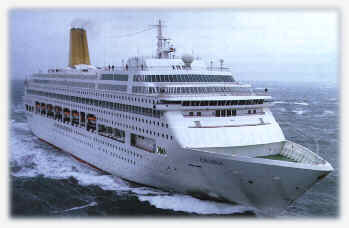 P&O Cruises has now expanded from just a one ship brand when the Canberra operated alone to three ships when Carnival bought the company to eight ships with the introduction next year of the second Adonia, now sailing as the Royal Princess. Of this large fleet, three ships usually the Arcadia, Aurora and Oriana, do a world voyage that involves long legs to and from Australia and the Far East, among other areas. This year, with the Oriana having sailed off in September, the three "A" ships, Arcadia, Artemis and Aurora, will depart in January, with Artemis on her last world cruise for P&O before being delivered to Germany's Phoenix Reisen as their Artania. 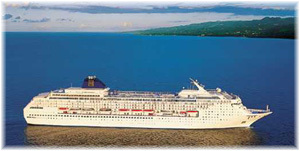 Her first long cruise for Phoenix will be a 14-day Round South America cruise leaving Hamburg in December 2011. Meanwhile, for those that missed the Oriana's sailing last week, Classic International Cruises' Athena will be leaving Rome on November 14 for Fremantle, where she is due to arrive on December 19, again in time for Christmas. There is still space remaining on this 35-night voyage. In addition to world cruises offered by Crystal, Cunard, Holland America, P&O, Princess, Regent, Seabourn and Silversea, and now Costa from Savona to Savona, the German operators Hapag-Lloyd Cruises will be running world cruises with the Europa and Columbus, Peter Deilmann the Deutschland, Phoenix the Albatros and Amadea and Transocean Tours the Astor. Like their sister line P&O, Princess Cruises has also started an experiment with an annual world cruise from Australia, which apparently was quite successful this year. As a result, the Dawn Princess is next up, to leave Sydney on May 25, 2011, on a 104-day circumnavigation. Again, part voyages are available so it is quite possible to recreate some of the old liner voyages of yore if you're the nostalgic type. Cunard Line has now been sailing for over 170 years and the Queen Mary 2 has almost completed seven seasons on the North Atlantic, very often running full. Meawnhile, the Queen Victoria has done the occasional voyage, as will the new Queen Elizabeth next year. These are usually January crossings in conjunction with world cruises. As the season of positioning voyages has just started, it is worth having a look at just how many such voyages are now available. According to the Official Steamship Guide, which includes voyages to North America and the Caribbean, there will be twenty-five Transatlantic voyages in October, nineteen in November and three in December. Norwegian Cruise Line will provide four of the October voyages, with three voyages each by Celebrity, Holland America, NCL, P&O and Star Clippers, and single crossings by Princess, Royal Caribbean, SeaDream and Silversea. Cunard will also do three crossings in November, joined by two each from Royal Caribbean, Seabourn and Windstar and single voyages from Azamara, Celebrity, Holland America, Oceania, Regent, SeaDream, Silversea and Voyages of Discovery. 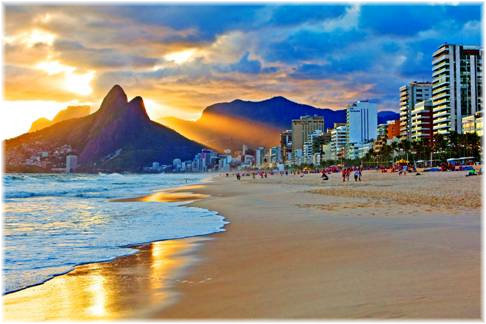 Single December sailings will also be provided by each of Crystal, Princess and Seabourn. Among these positioning voyages, to take just one example, the Norwegian Sun will leave Dover next week, on October 4, for a 12-night crossing to Port Canaveral. This is quite a bargain as fares are being quoted as low as $399 per person for an inside cabin, $499 for an outside or $1,299 for a verandah, plus taxes and fees. Such crossings, other than Queen Mary 2, are only seasonal, however, and those who wish to cross at other times, if they can't find a suitable date for the Queen Mary 2, have to fall back on the weekly container ships of Independent Container Line or MSC or the twice-monthly bulk carriers of the Polish Steamship Company that run from Amsterdam into the Great Lakes. All of these carry about half a dozen passengers on their regular crossings of the Atlantic. Yet another long voyage leaving next week is a non-stop 23-day voyage from Halifax to Buenos Aires. This is by Hurtigruten's Fram, which leaves next Friday, October 8 and arrives in Buenos Aires on November 1. Only a few passengers will be carried as the voyage is essentially to position the ship to Argentina for her 2010-11 Antarctic season. In a little different practice, bookings for this voyage were taken directly with the purser on board, but there will be no entertainment other than the voyage itself. Each winter, however, more than a dozen ships from Costa, MSC, Pullmantur and Iberocruceros flock south to Brazil and Argentina and each spring back again to the Mediterranean. A growing Brazilian market can fill every ship the Mediterranean cruise lines can afford to send during the south of the equator summer, even to the extent that Croisières de France cannot get space on their own Bleu de France and are having to send passengers to the Caribbean instead. Other than these seasonal crossings, Grimaldi Lines still offers a dozen berths in each of their year-round cargo ship sailings that leave Buenos Aires every ten days for ports in the UK and Continent, and vice versa, while German ships serve the cargo-passenger trade to and from Brazil. These are all booked by specialist cargo ship booking agents. An new start-up company called InnerSea Discoveries is due to begin its first season of Alaska small ship cruising in May 2011 using the 72-passenger Wilderness Adventurer and 88-passenger Wilderness Discoverer, two ships that they took over from the now defunct Glacier Bay Cruiseline. Here lies an interesting tale. "Tradewinds" magazine from Oslo last week reported that a company called West-Hardwick Marine Inc is the recorded owner of Sealodge II LLC, which in turn owns the Wilderness Adventurer. It also reported that West-Hardwick Marine holds mortgages on three Cruise West ships, the 84-passenger Spirit of Discovery, 102-passenger Spirit of Endeavour and 96-passenger Spirit of '98. The "West" in West-Hardwick Marine has not been identified but is thought to be a member of the West family. The question remains as to whether any of these three former Cruise West ships might end up trading in the InnerSea fleet. InnerSea is headed up by Capt Dan Blanchard, a former Cruise West master who as their director of marine operations oversaw the acquisition of seven small cruise ships for Cruise West. After becoming acting vice-president of operations le left the company in 1999 to join American Safari Cruises. Today, he also owns Blanchard Marine, a small shipyard where the two small ships were refitted and repainted in InnerSea's new forest-green hull. His executive vice-president Tim Jacox also spent twenty years with Cruise West. Seattle-based American Safari Cruises was formed in 1997 and operates a number of luxury charter yachts in Alaska, Mexico, the Pacific Northwest, British Columbia and the Columbia and Snake Rivers. Blanchard acted as ceo for American Safari from 2001 to October 2008 before he acquired American Safari, which is now operated as a brand of Blanchard's InnerSea Discoveries, formed in January 2009. When it was formed, InnerSea announced that it would be voluntarily placing client payments in secure accounts, something that will reassure some. Meanwhile, Cruise West's Spirit of Alaska, Spirit of Columbia, Spirit of Glacier Bay (which was to have been renamed Spirit of America to cruise the Mississippi River and the Great Lakes) and Spirit of Yorktown, owned by GE Capital, are apparently up for sale for interested buyers. Two of these, the Spirits of Glacier Bay and Yorktown were bought from Clipper Cruise Line as part of Cruise West's expansion in January 2006, but this was long before things started going wrong for Cruise West with the onset of the present downturn in September 2008. One of the events last week in the UK was the unveiling of a new portrait of Queen Elizabeth II to be hung in the new Cunard liner Queen Elizabeth, now completing at Monfalcone. The artist, 31-year-old Isobel Peachey, was commissioned by Cunard to complete the portrait, showing the Queen in the Yellow Drawing Room at Buckingham Palace. Unveiled at London's National Portrait Gallery, it will hang in the new ship's Grand Lobby. The young artist painted the Queen in three sittings and is the first female ever to paint the monarch. "At my interview with Cunard, I answered many questions about how I would approach an important commission - but it was only at the end of the interview that the subject was revealed as The Queen. This was both a shock and a marvellous surprise", said Ms Peachey. The Queen will only see the portrait for the first time when she names the new Queen Elizabeth in Southampton on Monday, October 11, and The Cruise Examiner will report from the event.